special packet for 100 guest includes: -use of the hall for 8 hours up to 2:00 am, -12 round tables, -12 tablecloths w/overlay, -100 chairs, -100 chair covers w/sash, -set-up and clean up, -(any choice)food catering, -soft drinks -dinnerware-glassware, -cake, -2 waitress, -1 security guards, -bartender; - Free Beers for the First 2 Hours All of this for just $3500.00. (Price for Saturday Only. 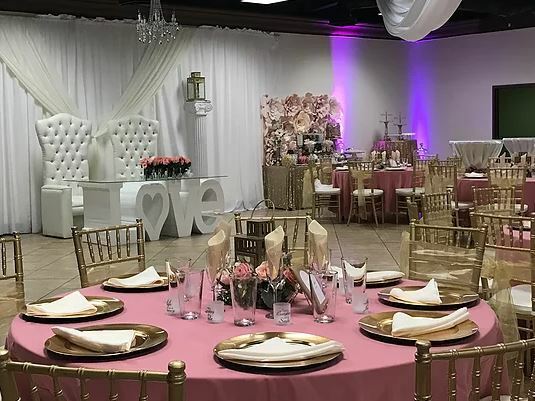 It has never been so easy to host an event, at Arrowhead Events Center we offer complete packages to help you enjoy your special day with out having to focus on minor details and devote your whole attention to family and the joy of a one in a life time event like a wedding or a quinceanera. Let us hanlde all of the work with more than 10 years of experience, no event is too big or too small for our team. Our experience staff will work with you hand-by-hand until your expectancy is exceeded. Your friends and family will forever talk about how wonderful your event was because every guest will be treated with the love and respect that everyone deserves.